If you have been planning a LR-308 build but haven’t felt like you had the funds to get started. This is the biggest bang for your buck. Never before have we had a builder set for this price. This combo will not only keep you from smashing your kid’s piggy bank to raise the necessary cash, but it looks awesome too! DPMS is the standard in .308 uppers. This is the latest DPMS 1st Gen upper design. Works with .308 Win, 6.5 Creedmore, .243,260 Rem, 7mm-08,35 Rem, .338 Federal, 270 WSM, .358 Win, 300 WSM, plus many more. · Constructed of thick-walled 7075-T6 aircraft aluminum and with a flat-top that will accept optics or a carry handle. · Includes the receiver only and does not include any other parts for assembly. 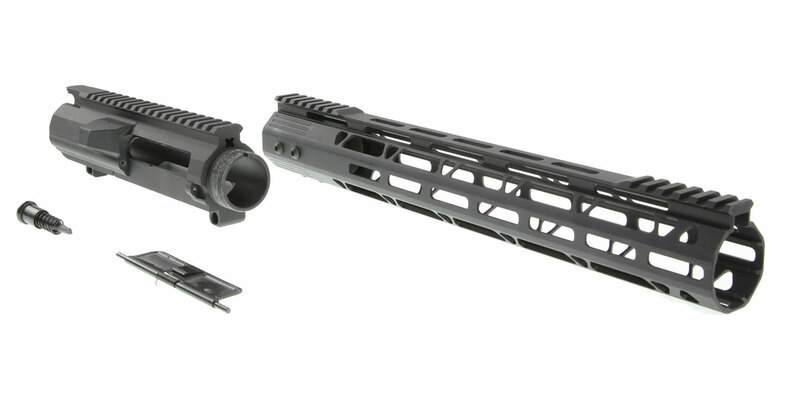 Most all the handguards on the market are for low profile uppers; just make sure when ordering your handguard it states for low profile or says it is for a standard LR-308. It does not fit the Armalite AW-10 rifle, some older Bushmaster rifles, and some odd custom manufacturers. If in doubt, look it up most of the time the lower manufacturer will state whether or not it fits the LR-308 format rifles. Premium High-Quality JE Machine 15” Free-float M-LOK Handguard Allows You To Comfortably Grip Your Rifle Yet Still Be Able To Mount A Variety Of Accessories.